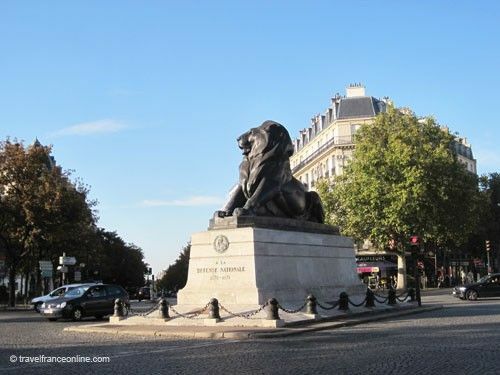 Place Denfert Rochereau, with Le Lion de Belfort statue in its centre, is a major Paris landmark. It's also one of the major crossroads of the left bank. It's indeed the merging point of Boulevards Raspail, Arago, and Saint-Jacques with Avenues René Coty, Général Leclerc and Denfert-Rochereau and Rues Froidevaux, Victor-Considérant and de Grancey. The public gardens Square Jacques Antoine and Square Claude Nicolas Ledoux delineate it to the west, and the Square Abbé Migne to the south. The original Place Denfert-Rochereau was open in 1760 and extended outside the Mur des Fermiers Généraux in 1789. It was once more extended over the tollgate Barrière d’Enfer (Hell's Gate) when the fiscal wall was pulled down, but the tollhouses were kept. These two buildings are now listed Historical Monuments. They are adorned with friezes and low reliefs depicting the French cities accessible via the road starting at the former tollgate. The eastern building once housed the offices and living quarters of the customs staff. The western building, at no2 Place Denfert Rochereau, now serves as the main entrance to the Catacombes, the underground necropolis created in the former quarries of Paris. The former building of the Embarcadère Paris-Enfer, the terminus of the railway line Chemin de fer de Sceaux, is located on the southeast side of the square. The line, inaugurated on June 23, 1846, was extended to Orsay in 1867 and Limous in 1869 and remained active until 1895. 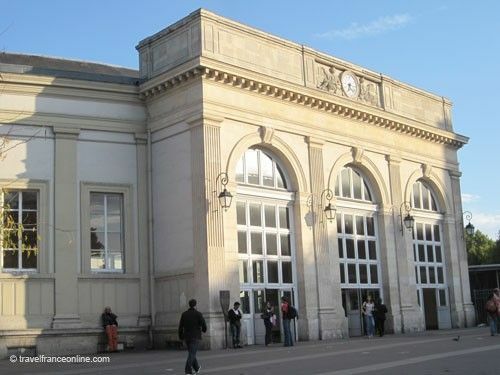 The superb building today serves as the main entrance to the Metro and RER Denfert-Rochereau stations. The Place d’Enfer (Hell's Place) was renamed Place Denfert-Rochereau in 1879. It pays tribute to Colonel Pierre Philippe Marie Aristide Denfert-Rochereau (1823-1878) who was Governor of Belfort when Napoleon III declared war to Prussia. The Territoire de Belfort or Porte d’Alsace, is a strategic natural depression as it links France to Germany. It is also a department created in 1871 by the Treaty of Frankfurt, and is part of the Bourgogne-Franche-Comté Region. Denfert-Rochereau defended the Territoire de Belfort with so much pugnacity during the Franco-Prussian War of 1870/71 that the enclave remained French after the Prussian victory. Bartholdi (Statue of Liberty in N.Y.) sculpted the Lion de Belfort in 1880. This allegorical statue represents Colonel Denfert-Rochereau who is said to “have fought like a lion” to defend Belfort during the 103-day attack led by the Prussian army between December 1870 and February 1871. The lion symbolizes his bravour and strength. The statue is a small bronze replica of the statue erected in the city of Belfort.